Discover which scuba fins won our editors' hearts. Right below you will find the top 10 Best Scuba fins of 2016. 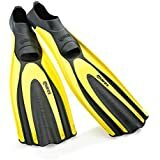 With the best scuba fins, it will help you a many ways such as giving you more power and flexibility in the water without exerting too much leg muscle. You'll have better control without straining your legs and result in fatigue and ankle pain resulting in an earlier return to the boat. The best scuba fins will provide you with better comfort and better control underwater. Not all scuba fins are designed the same and you need to find out which one is the right fit for your needs now. Thank you for visiting Aqua Junkies. Weâ€™ve done our best to provide you with the most in-depth consumer guide with honest and accurate information relating to the best scuba fins currently on the market. A significant amount of time has been invested in providing you with this information, so We do hope you find it useful. 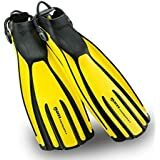 Most Recommended: If you haven't got the time to read our entire buyer's guide then I would suggest that you check out our editors' choice, Aqua Lung Slingshot Diving Fins , a quality scuba diving fins because of its scientific approach in making diving more effortlessly with its silicone power bands. The scuba fins have a 3 Speed Gear Shift to accommodate any dive conditions. Now, Let's find the best scuba fins in the market right now for you. 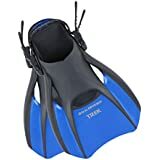 What Are The Advantages of a Good Scuba Fins? How To Take Care of Your Scuba Fins? 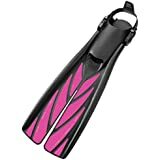 Every month, we will get you the best and latest scuba fins deals that we can find and update this section with the best recommendations within various price brackets that match your budget in the current market. View the best scuba fins under $300 & above $200! 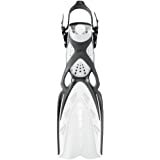 View the best scuba dive fins under $200 & above $100! View the scuba fins under $100 & above $50! View the best scuba diving fins under $50! After hours of research and comparisons, we have updated the latest dive fins in the shortlist table below that will aid you in your find for the best scuba fins that match your needs and budget. When choosing a scuba diving fins, you will often come across two type of foot pocket styles, full foot or open heel. Full foot fins are designed to be worn barefoot with a stretch fit and no adjustment. There are great for snorkelling and warm water diving. There are lighter and shorter than full foot types, it will be a good addition for travelling. Open heel fins are worn with booties and have a bungee straps or nonajustable spring to secure your foot. They're perfect for cold water diving. It provides the versatile option for divers to walk on the rocky surface to get to the dive site. Most divers would prefer open heel fins. Split and Paddle fins blades are the two common fin blade types that you will encounter, although there is another type called the monofin. Paddle fins are one blade design. They are stiff and requires more leg muscle to propel forward during a dive. 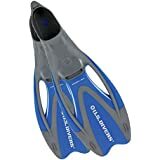 Most of the scuba diving fins listed in the table above are modified paddle fins which use flexible and durable materials making it easier on the legs and ankles. Split fins are designed to offer the same or more propulsion as paddle fins with less effort. Scuba fins are designed in two ways to increased thrust and boost efficiency. One of them is with angled vents, something like louvers to increase efficiency. The second method is with channels of soft material in the blade to trap scoops of water. If you goes for dive trip very often, another consideration for you will be the size of your fins. You would want your diving fins to be travel-lite. Some scuba diving fins are specifically for dive travel such as the US Divers Trek Travel Fins. Another consideration is the color of your scuba diving fins. Though, this is more of a personal style preference but when it comes to scuba diving, I would suggest getting a vibrant color such as bring yellow or pink. This will ensure that instructors and guides are able to spot you easily underwater and keeping a lookout for you. Having say that, if you are a shark divers, a better choice will be black fins. You want to be as stealth as possible around these guys. Scuba Paddle Fins provides more powerful thrusts as it is stiffer than the split fins. However, air conservation will not be comparable with split fins as more energy is required to thrust the fins. 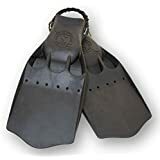 For technical dives or dive sites with strong currents, paddle fins should be used as you need to have powerful kicks to fight through the strong currents. 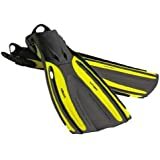 Scuba Split Fins are good for casual divers, or new divers who may not have the good kicking technique yet. The split creates a vortex that helps in propulsion and speed. 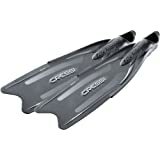 Divers with ankle or knee problems and legs that cramp easily can consider split fins as less energy is required to propel forward compare to paddle fins. However, if faced with strong currents, split fins may not be able to provide you with the needed power to fight through the stubborn currents. It is very common for divers to own more than 2 sets of scuba fins and used them based on the characteristics of the dive sites and their dive profile. Different types of scuba fins are used for different purposes. For example, long fins are for free divers who love to move more efficiently in water. 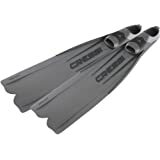 Good scuba fins enable you to manoeuvre underwater much easier, minimise air consumption over time and cover more distance without straining your leg. Just like your dive computer, after every use, you should always rinse your diving fins with fresh water. If warm water is available, it will help to dissolve any salt particles on your scuba fins. After the wash, allows the fins to dry completely before keeping them. Do not expose the scuba fins under the sun for a prolong period of time. It will hasten discoloration and cause premature cracking. Make sure that the diving fins are stored flat to prevent permanent deform bend or crease in the blade which could affect its performance. 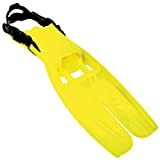 If you just bought your scuba fins online, make sure to keep the foot pocket inserts. The foot pocket inserts will help to maintain the shape of the fin's foot pocket when you are not diving, just like how a shoe tree works for shoes. U.S. 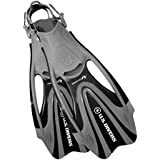 Divers Proflex II Diving Fins is suitable for free divers or beginner divers with its long blade design for power and styling. It can even use for snorkelling or tube fishing. May not have the maximum thrust due to the cut outs. Mares Avanti Quattro Plus Diving Fins is suitable for most types of divers. It is designed with four channels. That's four times the thrusting power. 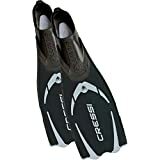 Cressi Men's Gara 3000 LD Diving Fins is suitable for most type of divers. It is made of softer blade material than the original Gara 3000. 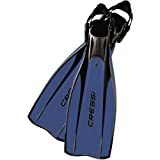 Cressi Gara Professional LD Scuba Fins is suitable for free divers, technical divers or recreational divers. It is made of three material blade for durability and the long blade adds efficiency to the fins. 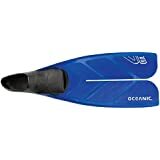 Oceanic Viper Scuba Dive Fins is suitable for recreational or seasoned divers. It can be used for snorkelling activity. Mares Superchannel Scuba Fins is suitable for recreation or seasoned divers. It is made for travel and for dives in warm water. Mares X-Stream Diving Fins is suitable for most type of divers from recreational, free divers to technical divers. It is well designed for optimal performance underwater. ScubaPro Scuba Diving Twin Jet Fins is suitable for seasoned recreational divers. The blades are angled to provide better power. Aqua Lung SlingShot Diving Fins is suitable for seasoned divers or technical divers. It is well designed with Three-Speed Gear Shift allows divers to dial in the best speed-to-effort ratio and match the changing dive conditions and their own leg strength. This makes the dive more comfortable, efficient and fun. Atomic Aquatics Split Scuba Fins is suitable for recreational divers or new divers. It is designed with split fins. 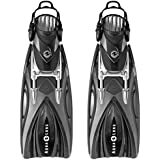 With the right scuba fins that fit your dive needs, you will have a more enjoyable dive underwater without straining or exert too much stress on your legs. Get yourself the best scuba fins to manoeuvre underwater much easier, minimise air consumption over time thus increase your dive time. Which scuba fins won the hearts of our editors? Check it out right below. What are the chances of having foggy goggles? Very high chance. Don't panic. There is an easy way. Simply rub a finger-full of saliva on the inside of the lens to equalize the temperature due to the difference in temperature between our body and goggles. It may sounds gross but it works!